Goodness!… They don’t even try to hide their Socialist leanings anymore! 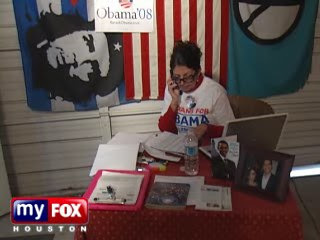 The Obama Houston headquarters displays the Cuban flag with a picture of Communist mass murderer Che Guevara. Let’s see. Castro endorses a Clinton/Obama ticket. Obama has Greg Craig, castro’s attorney during the Elian episode, as a senior policy adviser. He was for lifting the embargo before he was against it. And now his campaign workers put up a picture of Che Guevara that’s 3 times as big as Obama’s own poster in his campaign office. And a self-respecting Cuban would vote for this guy, why?